Only a few technologies were so widely adopted by the business world as it did in the case of cloud computing. Interestingly, the technology is still in the emerging stage. Towards the second half of last year, there was a marked increase in the number of enterprises dumping their local servers and migrating to the cloud space. While the trend is fast catching up among the smaller businesses also, most of the large corporates are hiring multiple cloud service providers to develop their applications. Importantly, this new system of accessing and processing data on the virtual space has opened up a new opportunity for IT firms which were facing growth stagnation. Reaffirming its top spot in the segment, Amazon Web Services (AWS), a subsidiary of Amazon (AMZN) registered a 45% annual growth in revenues from its cloud business in the fourth quarter, exceeding expectations. More than a decade after its launch, the cloud division has become a revenue spinner for the parent company. The plethora of services launched by Amazon cloud during the quarter, such as translation and transcription, a camera designed for AI computation and data centers for the government, puts it at a uniquely advantageous position to further scale up the business. The company’s cloud business has grown to such proportions that it would have to consider spinning off the division for ease of management. It is a similar scenario for Amazon’s closest rival Microsoft (MSFT) Azure. The cloud revenues of the Bill Gates-promoted company, which has made great strides in its efforts to catch up with Amazon, more than doubled in the final three months of 2017. The segment particularly benefited from a new deal with retail firm Costco (COST). For the past several quarters Microsoft has relied extensively on its cloud business to override the weakness in other areas of the business. Going ahead, the tech titan is well positioned to continue its recovery from the downturn induced by the PC-slump. For the first time after venturing into the cloud space more than five years ago, Alphabet (GOOG, GOOGL) last month said revenues of Google cloud, a combination of Google Cloud Platform and G Suite, have hit about one billion dollars per quarter. 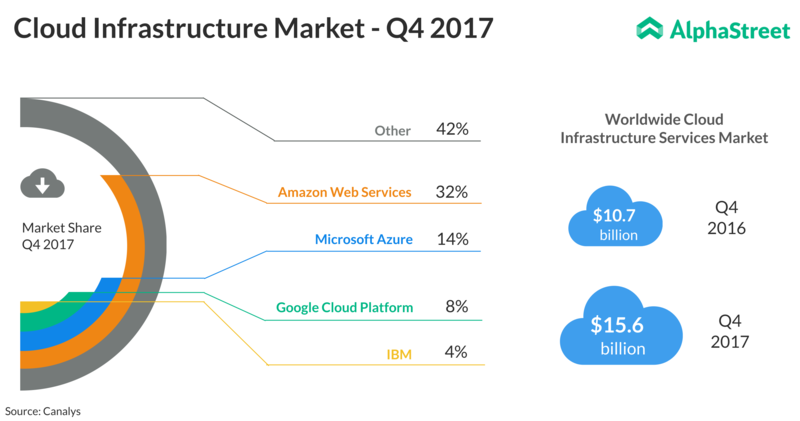 In the cloud infrastructure business, Google trails at the third place, behind Amazon and Microsoft. The most prominent new customers of Google Cloud Platform are store operator Kohl’s (KSS) and PayPal (PYPL). 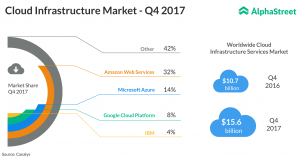 After recording a 30% top-line growth in its cloud segment in the fourth quarter, IBM claimed to have strengthened its position in the industry as a leading enterprise cloud provider. Experts are of the view that cloud infrastructure will emerge as the fastest-growing business in the coming quarters. The high costs will cool down as more players enter the market, adding fuel to the competition.